To say that anyone’s contribution to their field was invaluable and irreplaceable is a bold statement. Very rarely do the realities live up to these myths. Verne Gagne is an exception to that rule. He wasn’t the best businessman, or maybe not the best at interpersonal relations with his roster. What Verne had, however, was an eye for wrestling talent and the knowledge on what to do with them to maximize their potential. He knew that because he had been there and done it before. Let’s not get ahead of ourselves though. The story of the AWA starts many years earlier, when a young man learned the value of personal achievement. Laverne Gagne was born in 1926, and raised a proud Minnesota boy. He won several titles in his high school and early college years, including four Big Ten Conference Championships between 1944-49. Like many other boys of his generation he enlisted in the military during World War II. He served in the Navy, and upon his return home he went back to the University of Minnesota to capture two NCAA wrestling titles. He then followed his wrestling prowess to the 1948 Olympics and even had a short lived run in the NFL as a part of the Chicago Bears, just prior to that. When his football coach found out he had been moonlighting as a professional wrestler, he put Verne in the position of having to make a choice between the two. He was making more money wrestling than as a football player at that time, so the choice was easily made. Gagne had clearly learned the recipe for success in wrestling. Verne took to the road and honed his craft throughout the U.S. with title holding runs in Texas. It wasn’t long before he became famous in the Chicagoland area and the neighboring states. This was mostly due to his work on the Dumont Television Network, which also allowed him to become more financially stable at this time as well. After a long period of unsuccessfully trying to win the N.W.A. Championship, he decided to break away and form his own company and attempt to claim the Minnesota Territory for himself. In 1959 he teamed with Wally Karbo and acquired the Minneapolis Boxing and Wrestling Club. This entity, along with a few other smaller territories in that area would become the foundations of the American Wrestling Association. They then split from the N.W.A. and recognized Gagne as their Champion in August of 1960. For the next two decades Verne reigned off and on as the A.W.A. Champion. He always chose to work face, which allowed for a steady flow of heels through the promotion. He had storied feuds with some of the biggest names in wrestling at the time, and in it’s history. He warred against the likes of Fritz Von Erich, Mad Dog Vachon, The Crusher, Larry Henning and Nick Bockwinkel just to name a few. His dealings with wrestlers and promoters gave him the networking abilities to expand his company across several N.W.A. recognized territories. Many years before Vince McMahon unified the territories, Verne Gagne had designs on a national company. He branched out westward into cities such as Denver, Las Vegas, Salt Lake City, and San Francisco , as well as crossing the border north into the Canadian north in Winnipeg. With Gagne leading the way as owner, and Champion, the A.W.A. experienced widespread growth over these years. At the beginning of the Eighties, Gagne started to pull himself out of the limelight of the ring and began to focus on the promoting end of things. 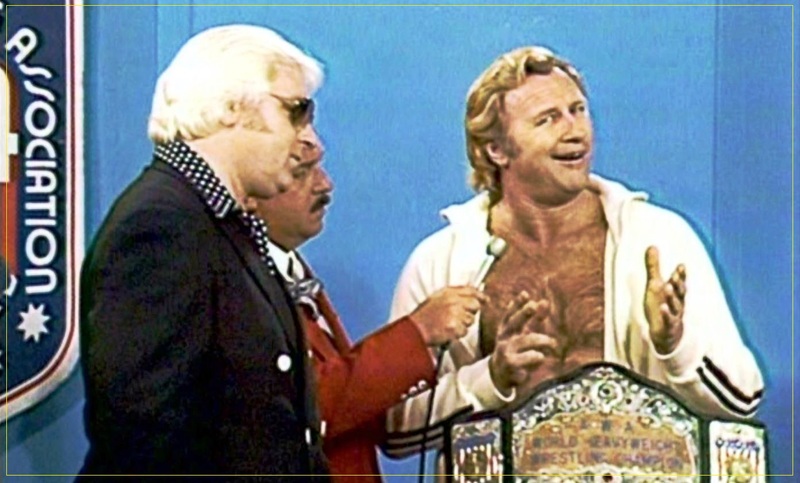 The championship torch was handed down to his longtime opponent, Nick Bockwinkel. Bockwinkel held the title on several occasions. Some of his biggest rivalries were with Rick Martel and, Olympic wrestler turned pro, Brad Rheingans. The feud that would leave the A.W.A. rocked and reeling from his short time there was Hulk Hogan. Verne was always a technical, mat-based wrestler and didn’t or wouldn’t see the championship potential in the muscle bound Hogan. On two separate occasions Gagne had dangled the title in Hogan’s face by allowing him to win the belt, only to strip it back from him via overturned decisions and Commissioner interventions. A dissention grew between the two because of this, and finally came to a head when Gagne tried to negotiate himself into fifty percent of Hogan’s lucrative merchandise royalties and sales in the United States, as well as abroad in Japan. This was the final straw for Hogan, who then jumped ship to the WWF and a guaranteed title run. There was a rumor, later corroborated by Hogan himself, that Gagne had paid the Iron Sheik to try and take out his knee prior to that departure from the promotion. Not long after Hogan left, several other A.W.A. workers began to trickle out for greener pastures in the WWF. Names like Okerland, Heenan, Adonis, Ventura, and Richter would go on to flourish in there as well. The vacuum left in the wake of the WWF’s “raid” of the territories was evident across that whole system, but no promotion felt the punch to the financial guts the way the A.W.A. had. Even as his empire started to show signs of crumbling, Verne Gagne would not yield to his adversaries. He began to establish new deals with television stations around his home area and also branched out nationally with a deal with ESPN to broadcast his product weekly. It was on this programming out of Chicago, on WGN, that I was first introduced to their show. He also never let his eye for talent stop roving around. 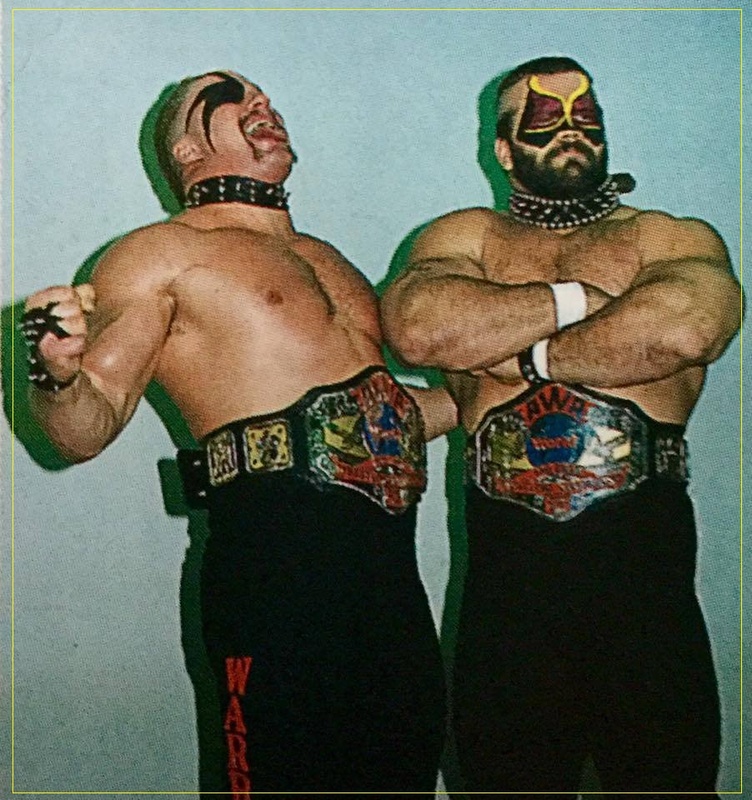 The Road Warriors, The Rockers, The Long Riders, a young Big Van Vader, Scott Hall, and Curt Henning were some of the workers he brought in to raise ratings. Many of the older veteran workers still called A.W.A. home at this time as well, and this allowed for heated rivalries between the opposing dynamics. The Bockwinkel and Henning matches are the stuff of legend. Soon after it began the relationship Gagne had with ESPN began to wane due to lack of interest by the network to provide weekly on-time programming. His show would routinely be postponed or ran at a totally different timeslot to accommodate another program. Verne turned his attentions in another direction to try and compete with the growing force out of the northeast. He inked out a working agreement with several other promotions who were also feeling the crushing grip the WWF was beginning to have on them. Jim Crockett Promotions, World Class Championship, Mid-South Wrestling and Continental Wrestling Association from Memphis came together with the A.W.A. to provide talent for the show that became known as Super Clash ’85. The show was mired with controversy and logistical problems from the start. It was rumored that the heads of the different promotions were recruiting talent from the very people they were there to work together with. Solidarity was indeed an issue. The show did provide fans like myself with a great alternative to the WWF product at the time and carried a strong audience throughout the South, West, and Mid-West. After that experience, Gagne decided to go out on his own and promote the WrestleRock ‘86 card that would see a 10 woman Battle Royal, and a jaw dropping triple main, with each main being a cage match. The entire card was stacked with talent and drew well in comparison to other events at the same time, but still didn’t get the press reaction that Wrestlemania II garnered earlier that year. There were three main champions that held the A.W.A. together during these years. The belt passed back and forth between Curt Henning, Rick Martel, and Stan Hansen. Verne tried several times to put the title on his own son Greg, even though he received criticism over nepotism claims. Greg was also viewed by some of his peers as not having what it took to sell the seats to earn the spot of A.W.A. Champion, even if he was the boss’s son. Greg did have a successful tag team career with Jumping Jim Brunzell as the High Flyers. Verne also had famously had problems with Stan Hansen in 1986 when he refused to drop the belt to Nick Bockwinkel and took the title to Japan with him. Gagne stripped him of the title and awarded Bockwinkel a replacement belt in the World Title’s absence. Nick told the story for years after that before Hansen finally returned the official title, he had drove over it with his pick-up truck. Despite the problems suffered through promoting the Super Clash, it was followed up by three more of these events. 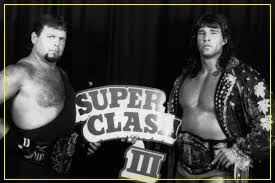 Gagne used mainly his own talent for the second, but Super Clash III held the highly anticipated main event between Jerry Lawyer who represented the Memphis Wrestling camp and Kerry Von Erich from his father’s Texas promotion of WCCW. It was a bloody brawl that saw Lawler come out the winner in a disputed decision by Von Erich. It was the only pay-per-view ever hosted by the promotion. The fourth and last Super Clash event would see the rise of Larry Zbyszko as its new Champion until his departure from the company in 1990. Verne had out his last hopes in son-in-law but his hopes were dashed when Zbyzsko left for WCW. After trying to maintain the promotion through the Summer of 1991, it finally folded. Even though many people in the wrestling world want to claim it was the WWF that finally choked out the A.W.A. and the other last remaining territorial promotions, I have to say that in this particular case, it was probably not totally the cause. It is fairly well known that for many years, Verne had been using the value a piece of property he owned along Lake Minnetonka to maintain his finances in the business. During this same time the local government decided in it’s ambivalence to take this property by a ridiculous writ of eminent domain and turn it into the Lake Minnetonka Regional Park. This is just one more instance of the government taking what it likes, with no concern for whoever may be in their way. The promotion closed shortly there after. Even though he may not have been the greatest businessman to ever run a territory or promote a show, Verne was possibly the greatest trainer and possessor of the eye for wrestling talent that has ever lived. He knew what it took to be an athlete in this business and excel in that aspect. Verne passed away in Bloomington, Minnesota at the age of 89. He has been honored by several wrestling organizations such as the WWE, WCW, and The Professional Wrestling Hall Of Fame. He also received the Lou Thesz award from the Cauliflower Alley Club in 2006. 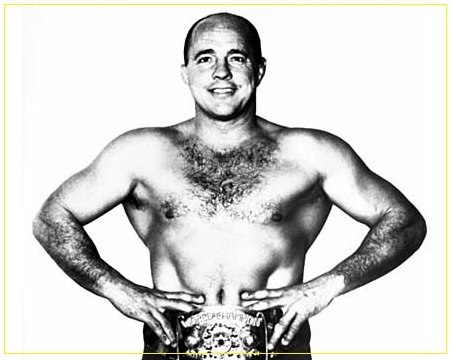 Verne Gagne trained nearly a hundred wrestlers in his tenure with the A.W.A.. The talent that passed through his doors is amazing, and his effect on this business is innumerable to count. 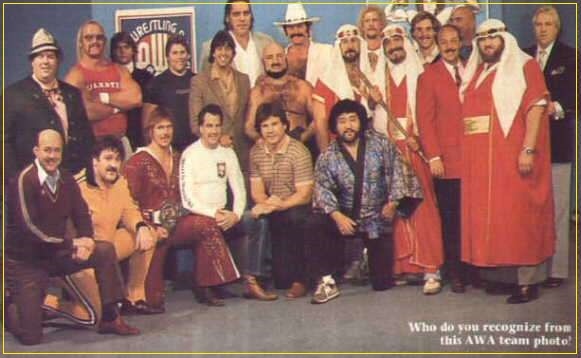 Ric Flair, Hulk Hogan, Bobby Heenan, The Iron Sheik, Ricky Steamboat, Bob Backlund, Scott Norton, Bruiser Brody, Jerry Blackwell, Wahoo McDaniel, Baron Von Raschke, Buck Zumhofe, all the previously mentioned talents in this article and many, many more were members of the A.W.A. at one time or another. It is without a doubt, a greatest hits list of talent. Well that wraps it up for this week Bruthas and Sistas. I know it was a bit of a read, but trying to cut too many corners would just not have done justice to such a great promotion that left a more than sizeable footprint. I hope you enjoyed our stop in Minnesota. Now let’s set out sights on next weeks destination. Bring your hand fans and a cold drink, it can get kinda hot in The Sportatorium. Our wrestling history is gold friends, so DIG IT! !